Feeling tired all the time? Read on as I have some exciting news! I’ve been working away in the background for the past few months investigating and trying out new NUTRITION products that will help support my clients and friends on their wellbeing journey. We know gut health and clean eating massively contributes to an overall feeling of wellness BUT REALISTICALLY this can feel really hard to get started with.  Confused about where to start with food?  Interested but lacking in motivation?  Overwhelmed by products and supplements? Hi I’m Sarah and I’m a total stress head. There, I’ve said it! As it’s #stressawarenessday I wanted to admit to it and share some ways to help manage the overwhelm. Here are some (not so helpful) things I’m really good at. How many of these relate to you? I keep trying to be perfect. I strive to do well in everything I turn my attention to – work, home life, friendship, being a ‘good military wife’. I know my mental state has directly contributed to my physical symptoms. Learning to let go of striving for perfection has been a huge journey. Most of the time I can manage this but sometimes I’ll wonder why things are building up again and I’ll realise I’ve set unrealistic and unattainable expectations. *DEEP BREATH* Cue some tapping and repeating various phrases such as “It’s OK to be me” and “My best is good enough”. Of course, I’m only human and sometimes it gets too much and only a good cry/rant/long hot bath will do. 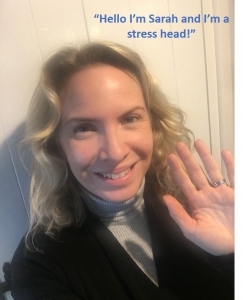 Stress levels, anxiety and pressure affect us all and I share this list because I am well qualified to help you in your own unique and wonderful way. Working both physically and emotionally I can help you, your children, your friends & family be truly listened to. Using kinesiology we can find out what the body says is going on (it often isn’t what you’d expect) and what is needed to rebalance. 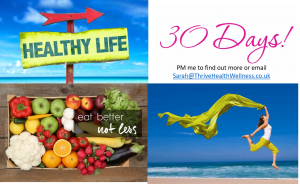 Let me help you unpick what’s going on in your life, mind and body and work with you to create a personal plan back to wellness and feeling back in control. On Stress Awareness Day, take a moment to put yourself first. Think about what’s bothering you the most – is there anything you can do about it, anyone to talk to about it or anything that can help? If you’ve found yourself nodding to anything written above, get in touch to find out how I can help you feel stronger again. Have you ever suffered with anxiety? 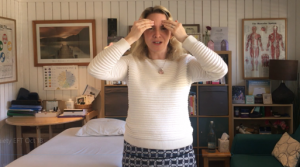 I struggle with having irrational anxious thoughts at times and have been really focussing on self care techniques including EFT. Do you struggle to control your thoughts? Do you ever feel the anxiety build and feel out of control? Learn about how to Silence the Chimp and use tapping (EFT) techniques to break negative thought patterns & worries, turning them into a strengthening, positive affirmation. Hands up if you like using Bach Flower Remedies? They are simple FABULOUS at helping us manage our emotions. Over the next few days, I’ll post about the most commonly used remedies and how they can help you. Bach flower remedies show up as helping in the majority of sessions and I thought it would be helpful to share the most popular ones. Read below to see which fits with how you’re feeling and give them a try. Each of the 38 remedies discovered by Dr Bach is directed at a particular characteristic or emotional state. They are not necessarily a personality test answer but do help with how you’re feeling at a particular moment. Suitable for use with babies and children as well as us grown-ups, you can squeeze 3-4 drops under your tongue or pop in a glass of water. Adding them to a bottle of water you drink throughout the day will be a great way to provide ongoing support. Decision making can be hard. I’ve had a few clients in the past week facing some big decisions. While these two quotes may initially appear to be the antithesis of each other, take time to pause and reflect. Staying stuck in a situation because you are afraid to change it will lead to regret. Staying in a situation because you don’t know if it’s time to quit or try harder can drive you mad. Close your eyes and picture yourself 3 years from now, or next year or even just at Christmas. Picture what life would be like. Are you in the same environment? How does this image feel to you? Does it make you feel relaxed and free, or nervous and tense? Play out different scenarios in your head and pay attention to how your body and mind reacts. Do you sense tension or release, does your heart soar or feel trapped, can you see a slight refocusing of the image or a completely different picture? When we feel stuck, we often know the answer deep down in our gut. Ignore everyone, deflect advice and give yourself time to connect with what YOU truly want. After all it’s YOUR life. When you feel you have chosen a path, discuss with people you trust, help them colour in the outline for you and feel supported.